The atomizer cleaning devices are used in the robot area for the automatic cleaning of rotational atomizers. It is a cleaning device for rotary atomizers, especially EcoBell3. The cleaner can be used for water- and solventborne 1K and 2K paints. The atomizer cleaning device has been designed for the use with waterbased paint systems. 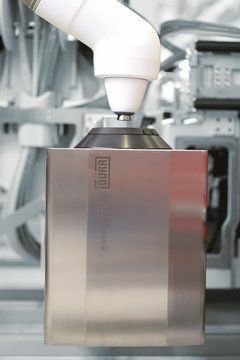 The EcoBell Cleaner B (compact external charge) can only be used with Dürr rotational atomizers of type EcoBell3 C.